In general, the creation of an individual presentation method requires certain programming skills. For our example, we provide ready-made scripts as downloads. The prerequisite for using our script is that you are a website owner. To reuse such custom column representations, the display method should be mapped to a site column. This allows users to add the site column to their list and have the new look in their forms and lists without further configuration. In Site Settings, in the Web Designer Catalogs category, click the Site columns link. Assign Level of competence as the column name and select Choice (menu to choose from) as the information type. Click OK to create the site column. Navigate through the Site contents to the Site Assets Library. Upload the downloaded files LevelOfCompetence.js and LevelOfCompetence.css to the library. These files contain the entire source code of the own presentation method. For the next step you need PowerShell. In this case, we use the SharePointPnP.PowerShell Commands. Customize the URL in the Link Display Method Linking.ps1 script and run the Link Display Method Linking.ps1 script to link the new Level of competence site column to your own display method. The Level of competence site column is now available in your SharePoint site using the new display method. Navigate to a list and open the list settings. 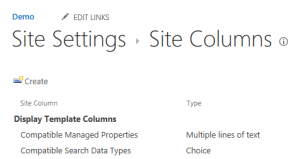 Click Add from existing site columns in the Columns section. In the Available site columns, select Level of competence and click Add. Click OK to add the site column to the list. Navigate to the list view and create a new item. The Level of competence column appears in the list form with the new design. It’s a good idea to create the new site column in the site collection so it can be used throughout the site collection. The example described here is a relatively simple use case, but you can also implement very complex business applications with the methodology used. If you have any questions, please contact me at any time. Our related video tutorial might help you as well. For English translation, just adjust the settings to display English subtitles or your preset language. I am a passionate SharePoint Solution Architect since SharePoint 2007. Together with my team @IF-Blueprint I am working on constant improvements to the business world. I love challenging tasks and beautiful solutions that people give me credit for.